← @ New York…Yet Again. 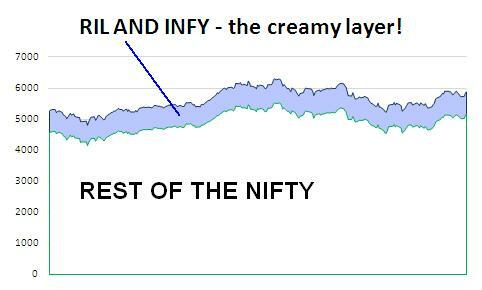 Did a crazy amount of number crunching on spreadsheets recently – trying to test the impact that INFY and RIL have on the NIFTY. I had earlier written about RIL being a sloth and I guess that was not enough to wake it up ;). And now that INFY has enthused no one with its results people might slowly start offloading this much over-owned stock. HCL Tech seems to be written about a lot these days and yes, TCS continues to deliver. Anyways, I tried to strip out the two bellwethers (really?) out of the NIFTY and see how things have panned out over the last one year period (20Apr2010 to 20Apr2011) . The results did not surprise me much – these two collectively have behaved quite much like the NIFTY with some dispersion coming out between the two data sets in recent times (bottom chart). The process itself has been quite a pain. The capital structure of companies mentioned on the NSE website is definitely incorrect. And I am not talking of some small cap, Ramprasad Chatak Mills kind of scrip, these are the largest listed companies by value in the Indian market! So having realised that error, I went to other places (BSE!!) to pick up the number of issued shares data and came up with the following charts after a lot of blah blah spread (under the) sheets. Corporate actions like splits and bonuses have also been accounted for. 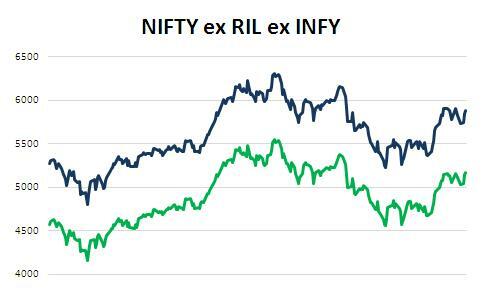 The green line is the NIFTY sans INFY and RIL while the blue line is the true blue blooded NIFTY as we track it. And yes, I don’t have time to write to the NSE and point out bugs/errors on their website. The heartening thing is that the share (by m.cap) of the two loud-in-the-media companies has dropped from ~13.2% (on 20Apr2010) to ~12.1% (on 20Apr2011). Good!